Nowhere on the page was there any indication that I had completed my transaction successfully. The page also contained this somewhat perplexing sentence: “Otherwise, please try again later?” I took this as an invitation to try to complete my purchase at some later time when, presumably, whatever glitch the Web site had encountered had been corrected. In fact, I tried again later with the same result. 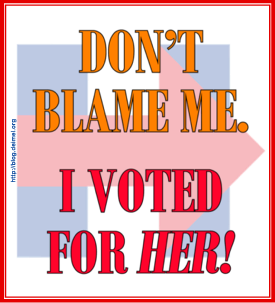 I even tried a different credit card—my debit card for my checking account, in fact, where I knew my balance could cover the charge many times over—again with the same result. The tickets were a gift to my son and daughter-in-law, and my persistence was the result of anxiety on my son’s part that tickets might sell out quickly. I knew that time with Desmond Tutu was very special, and I didn’t want this opportunity to be missed. Eventually, I decided to call the diocese. I explained the situation to the person who answered the telephone, and she transferred my call to the office administrator. The office administrator was apparently unavailable, and I had to leave a voice message. Not having received a return call from the diocese by late afternoon, I dialed the diocese’s number again. The person answering the telephone remembered me from earlier, transferred the call again, and I again left a message. Last evening, I called my son to tell him that, although I had not yet bought the tickets, I was working at it. I decided that I would allow time this morning to receive a call from the diocese, but that I would make a third call if I had heard nothing by mid-morning. Early this morning, I got an automated call from my credit card company. The call was clearly about my attempts to use the card, but after pushing numerous buttons on my telephone keypad, I was still clueless as to what, exactly, had prompted the call. I was getting anxious, however. Speaking to a person didn’t seem to be an option, so I hung up and called the customer service number on the back of my credit card. 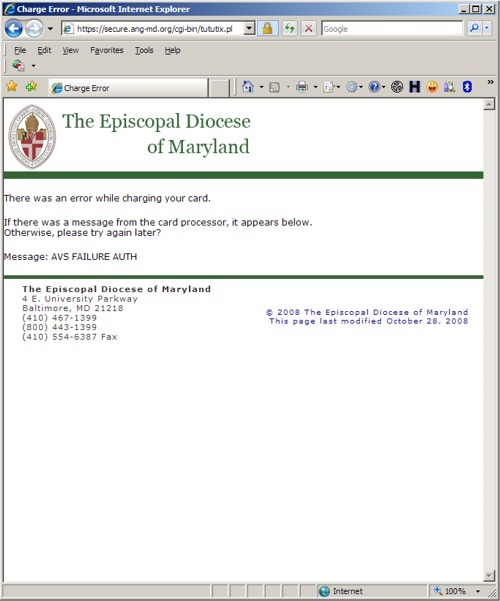 When I did talk to a real human being—this actually happened with reasonable dispatch—I was told that there were four charges for $50 to the Episcopal Diocese of Maryland on my card, and that there was a fraud hold on my credit card. The charges were being processed, I was told, and could not be disputed until they were actually posted to the account. I was told, however, that the diocese could probably issue a refund. Seriously alarmed at this point, I visited my bank’s Web site to view the status of my checking account. There I discovered another four $50 debits pending. I called the diocese again. I gave the person who answered the telephone the short version of what had happened and made it clear that I really wanted to discuss the matter with someone who could help as soon as possible. (I think I did not speak to the same person who handled my calls yesterday.) Everyone else in the office was in a staff meeting, I was told, and the meeting would not be over for about an hour. I was given the option of leaving a message for the person actually responsible for the Web site. Eventually, I did that, but not before raising my voice in order to extract a promise that the message would be communicated that I really needed a return call as soon as possible. Just over an hour later, I received a call that was probably a response to my first two voice-mail messages. The office administrator was eager to fix the problem, and she assured me that ample tickets were available. It took me a few minutes to communicate everything I knew about the problems I had encountered. She asked me to fax the error page to the office, and I agreed to send to above image via e-mail, along with other information needed to clear up the mess. So what went wrong? By the time I finally spoke to the office administrator for the Diocese of Maryland, I had learned, via Wikipedia, what AVS is. (I had not encountered the acronym before.) “AVS” stands for “Address Verification System,” a scheme that checks digits in the supplied address of a credit card user against account records. 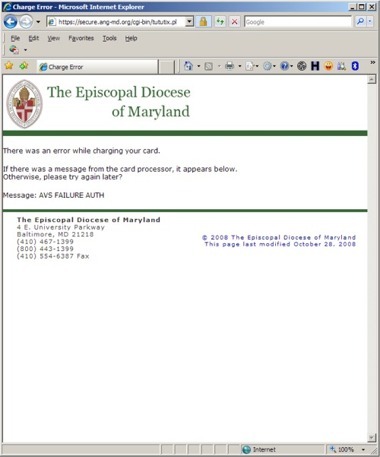 In the case of the Diocese of Maryland site, I suspect that the information I supplied did not check out. Since I am confident that I entered my own address correctly, either there was a problem with my Zip Code versus my Zip+4 Code—perhaps the Web site did not expect my full Zip+4 entry—or the site confused my address with that of my son, to which I wanted the tickets sent. Apparently, the Web site initiated an AVS check, which can return any of a number of codes indicating which digits matched and which did not. After the AVS check, the Web site should have decided either to approve the sale and display a success page to the buyer or to reject the sale and display some comprehensible error message on a failure page. My guess is that AVS code was something other than D or M (which indicate matches), but there was enough of a match to conclude that the transaction should go forward. The sale was completed, but the failure page (and no success page) was displayed. There are some lessons to be learned here, and not to buy tickets from the Episcopal Diocese of Maryland may not be the most important one. The most distressing lesson of course, is that the diocese’s Web site suggests a way to scam unwitting Web shoppers—occasionally tell a purchaser that the purchase has failed but that they should check back later. They can be charged twice and might never notice. (I can think of ways to make this scheme even more effective, but my objective here is to protect consumers, not con artists.) The most important lesson is to verify that a Web purchase has actually failed when it seems to have failed. Contact the merchant immediately and do not try to complete the purchase a second time. My behavior was, in retrospect, pretty dumb, but I wasn’t expecting to be fleeced by an Episcopal Church judicatory. Postscript. I was never successful in purchasing my tickets on the Web. I finally completed the purchase over the telephone.